The Municipal Art Society of New York (MAS) commends the New York City Council for its recently released package of small business bills. For more than a century, MAS has been a leading advocate for the indelible character and vibrancy of our city’s streets, which is inextricably connected to the health of our small business community. Unfortunately, the vacancy rate in some of our city’s retail corridors is higher than 20%, or more than four times the rate expected in a healthy market. 1 Although many types of retail businesses have shuttered in recent years, the increasingly frequent loss of small, “mom and pop” businesses has had the most profound effect on the neighborhoods. The small business package is a significant step toward addressing the city’s vacancy issue and the lack of fundamental rights and protections available to commercial tenants. While we are supportive of the legislation set forth in the small business bill package in its entirety, certain bills highlighted below best adhere to MAS’s values with respect to protecting and promoting a meaningful public sphere and a high quality of life for all New Yorkers. 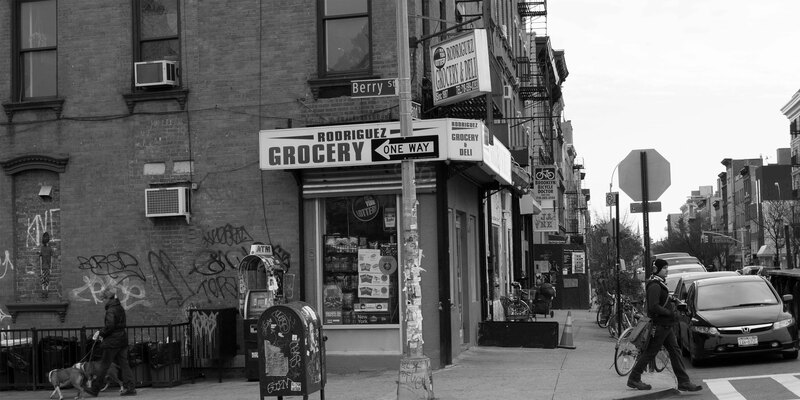 Corner grocery store in Williamsburg, Brooklyn. Photo: Wikimedia Commons, LWYang. Modifications: photo cropped and transformed to black and white. Int. No. 1049-2018 requires the Department of Small Business Services (SBS) to conduct routine evaluations of the state of the storefront business environment in every community district at least once every five years. This is a crucial first step in gauging the changes in streetscape composition over time and identifying those neighborhoods most in need of protections. Further, assessment criteria promulgated under this legislation includes a variety of factors such as district demographics, number of vacant storefronts, community involvement, opportunities for promoting a vibrant mix of commercial uses and improving the built environment, and a survey of storefront business owners. The flexibility provided by these factors will allow SBS to fairly and adequately assess the overall health of small businesses. This, in turn, has the potential to better inform decision-makers who will continue to update and improve the parameters of legislative protections as the issue of commercial tenant harassment and displacement evolves. MAS supports Int. No. 1408 which would require developers of projects receiving $1 million or more in financial assistance from a City agency or economic development entity to provide affordable ground floor retail space at such projects. Int. No. 1408 would promote small business entrepreneurship opportunities while fulfilling local retail needs and reducing vacancies. The creation of a public, online searchable database of all taxable premises and the monthly rent for such premises, as delineated in Int. No. 1472-2019, would promote greater transparency and equity in commercial landlord-tenant lease negotiations and/or renewals. MAS believes that the database will provide a vital mechanism for the collection of necessary data that can be monitored and analyzed to determine trends and/or areas of particular fragility for small businesses. Int. No. 1473-2019 requires the owner of any storefront property to register with SBS after such storefront has been vacant for 90 days, and thereafter, obligates the owner to update the registration every 90 days until the property is leased or occupied. Further, the bill also imposes a civil penalty of $1,000 per week for owners who fail to register their properties with SBS. MAS supports Int. No. 1473-2019 because it addresses commercial vacancy directly through the imposition of monetary penalties. Such fines will serve as a much-needed deterrent to landlords seeking to warehouse vacant property for excessive durations. As a member of the United for Small Business NYC coalition (USBnyc), MAS is supportive of the package of small business bills which create the legislative protections necessary to maintain the small business landscape of New York City in the years ahead. Retail spaces are a significant part of what makes New York City’s neighborhoods vibrant places to live, work, and spend leisure time. MAS believes that the loss of many small businesses and prolonged vacancy are a threat to the vitality of our city, but the small business legislative package is a proactive and necessary step to protect these businesses. Thank you for the opportunity to provide comments on this critically important matter. C. J. Hughes, A Sign of the Times: More For-Rent Notices in Manhattan, N.Y. TIMES, Mar. 7, 2017, link.